Bake chicken wings in oven at 350 degrees until tender (1 hour). Mix together soup mix, preserves and Russian dressing. 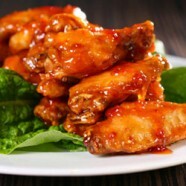 Pour mixture over chicken wings, coating each piece and serve.